Eggs for breakfast, eggs for dinner, eggs for lunch…we definitely eat our fair share of eggs around here. And how can you blame us when eggs can so easily be reinvented a hundred times over whether you’re frying, boiling, scrambling, baking or poaching them. So here’s yet another way to make eggs and if you haven’t already tried this, definitely add it to your list the next time you’re entertaining guests. This dish will take a little extra time since you have to whip the egg whites, but the end result is oh-so-fluffy and delicious. 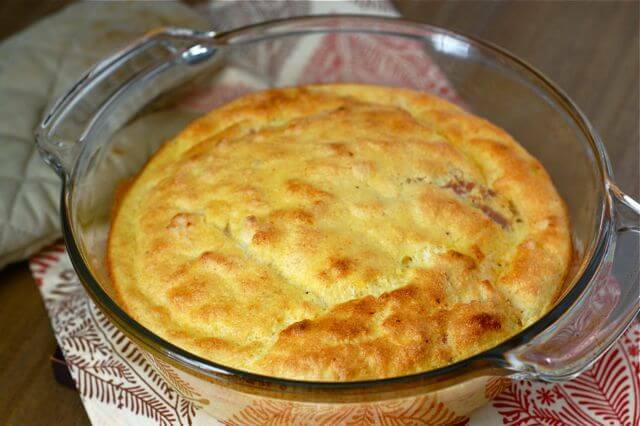 And feel free to make this soufflé your own by adding bits of ham, cheese, herbs or even veggies. It’s the prefect weekend brunch treat! Preheat the oven to 400 degrees F. Grease a 9-inch round baking dish. Separate the eggs by placing the whites in a separate bowl from the yolks. 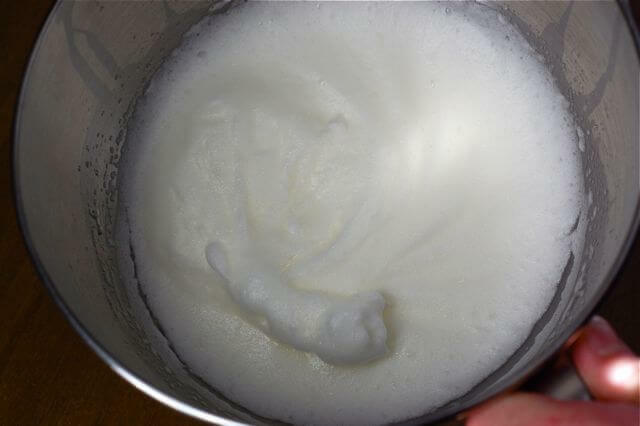 Whisk the egg whites with a mixer on high speed until soft peaks form (pictured) and set aside. Melt the butter in a small saucepan over medium heat. Once the foam has subsided, whisk in the whole-wheat flour (this is called making a “roux”). Keep whisking until the mixture begins to brown then turn the heat down to low and slowly add the milk while still whisking constantly so lumps do not form. Turn it back up to medium and continue whisking until the milk mixture begins to thicken, about 5 minutes. Remove the pan from the heat and add 1/8 teaspoon salt and a pinch of pepper. Quickly whisk the egg yolks into the milk mixture without allowing them to cook. Pour the milk/yolk mixture into the fluffy egg whites and using a rubber spatula carefully fold the two together without crushing the air out of the egg whites. Also add and mix in filling (like ham and/or cheese) if desired. Do not overmix. Scoop the mixture into the prepared baking dish and bake until lightly brown on top, about 20 – 25 minutes. Serve immediately (otherwise the soufflé will “fall”). I make a lot of frittatas because I can pack a lot of veggies into them (this smoky cauliflower frittata is my current favorite: http://emmycooks.com/2012/02/06/smoky-cauliflower-frittata/). But a souffle looks and sounds so much fancier! And I love the light texture. And you make it sound so easy. Maybe this will embolden me to give it a try! I have a question about butter and ghee. Are these two things the same? Are they interchangable? Is ghee a healthier form of lard? Basically when would I use butter and when would I use ghee? Glee is clarified butter. Since all the milk solids and water is removed it has a much higher smoke point and is much better then using butter when used at a high temp. I made my first souffle a few months ago and it really is do-able, even for us ordinary cooks! Love this recipe! Have made it twice this week since ham was our meat for the week & eggs are on sale. It even did well when I forgot to spoon it into the baking dish & poured it. My husband was impressed. I made this for breakfast today, and it seemed like at even 20 minutes, the egg white was not quite cooked at 20 minutes. How does the egg white look and feel on a cooked souffle? Was the egg white mixed in with the yolk mixture before you baked it? Was the top brown? I had the same experience as Katie. The top was brown and delicious looking and then when I broke into it… it was like raw egg soup. I ended up cooking it for an additional 20 min before the eggs were completely cooked. Maybe next time I’ll cook it in a 9×13 pan instead of a 9″ round. Any other ideas where I might have messed it up? I have made this recipe dozens of times and not experienced that same issue. Are you sure your oven temperature is calibrated correctly? I did mix in the yolk mixture but perhaps not enough because this was my first souffle; I didn’t want to push the air out of the whites. The top was brown and very crusty after I did end up cooking it for an additional 5 minutes. This is just my first experience and didn’t know what the texture was supposed to look like cooked. I would say my whites were just still moist looking, but for sure not soupy. It should be light and fluffy but firm/set (not runny) once it is done and slightly cooled. Woohoo! Made my first souffle tonight. Never even tasted one so wasn’t sure what to expect. The kids loved it. Definitely will do that again. Thanks! Where do you find organic grass fed butter in Charlotte? I get it at Earth Fare…it comes in a gold wrapper and is made by Organic Valley (and says “pastured” on the label, which means grass-fed). What other pan can I use if I don’t have a 9″ round? I have other round baking dishes but none are very tall. You may try a 9″ pie plate. A deep dish one might be even better. My 6 yrs old doesn’t like eggs but just started eating frittatas. So I’ll just this a try and see if she will eat this too. I’m tried so hard to reduce our beef consumption. Thanks as always! I just made this for dinner, so good! I put it into several ramekins vs one large dish, then reduced the cook time to 15 min. Thanks for the recipe! I was searching for something to make for Christmas day brunch. Yep,I’m trying to get a jump start. I think I will try this but would like some suggestions for ‘herbs’ to add. I don’t want to add any ham as will have some organic bacon as a side, but cheese and possibly some herbs for flavor and would like some suggestions that would complement the eggs well. Mrs. Dash garlic and herb. This was really good, I put in broccoli, cheddar cheese and herbs. I am very new to true cooking. 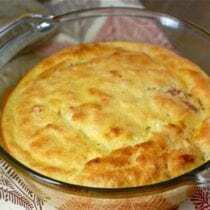 I tried this recipe and the souffle came out GREAT! I added shredded cheddar cheese and ham. As long as you beat the egg whites long enough and are gentle enough when you blend everything together (thoroughly!) this is an easy recipe to follow! Could you use tapioca flour instead for the roux? Hi Laura. We’ve not tried that. This was so yummy and super easy to make! I added crumbled sharp cheese and dill to mine and it was delish! Thanks for the recipe!